Three universities share how they have tailored their classrooms for immersive learning, collaboration, large classes, pedagogical research and more. The concept of designing spaces for active learning has taken hold over the last decade, starting with projects such as North Carolina State's Student-Centered Active Learning Environment for Undergraduate Programs (SCALE-UP) and MIT's Technology Enabled Active Learning (TEAL) classrooms. These efforts focused on transforming classrooms from the lecture format to project-based work. As active learning classrooms have spread to many other campuses, however, there has been a growing recognition that learning and study spaces can't be uniform in design — and that it is preferable to tailor them to specific pedagogical and technological needs. For instance, when Indiana University embarked on its Mosaic Active Learning Initiative, its campus leaders wanted to stress the diversity of spaces involved. "When we launched Mosaic, we realized we didn't want to land on one specific model, for a lot of reasons," said Julie Johnston, director of learning spaces. "When we design a room, each one looks slightly different. We are going to create spaces and evolve them. We create a prototype, ideate and change it, so each one is like a tile in a mosaic." Usually a new space at Indiana is designed to meet a specific need or goal. "Some of our classrooms have a more apparent goal than others. Some would just fit the definition of flexible and active, but for others there is a real history behind how we designed it the way we did," Johnston explained. 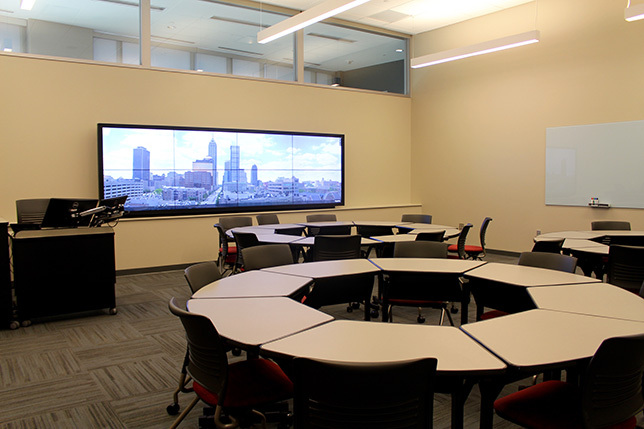 For instance, an Immersive Showcase Classroom on the Indiana University-Purdue University Indianapolis campus was designed to investigate the interactive, immersive experience with students. It takes advantage a video wall that uses Mersive Solstice software to foster collaboration, decision-making and content sharing via any mobile device. The professor has the ability to project multiple points of contact wirelessly, so everybody in the room can participate, Johnston said. Another example at IU: A proposal from the departments of Geography and Anthropology resulted in a Collaboration Learning Studio designed to bring active learning to classes with large numbers of students. The room has 16 collaborative tables accommodating 120 students. Students can share their work on a 20-foot video wall. Each student collaborative table is equipped with a 40-inch flat panel, PC/keyboard/mouse, VGA and HDMI laptop connections, cable cubby, controls for switching the content displayed, and (because the room is so large) a push-to-talk microphone. Students can switch the display source from the table's PC to their laptops with the push of a button. Instructors can push content to the collaborative table monitors, or display content from any of the table monitors on the video wall or projectors. Mosaic, which rolled out in the fall of 2015, actually formalized a movement that was already happening on the IU Bloomington campus. "We started designing these spaces and realized that we could continue to do that, but the reality is that our goal is transformation in the classroom to active learning. It is difficult to do that by just creating spaces," Johnston said. IU has a large group of fellows teaching in active learning spaces and researching the impact. "We believed that partnering with the faculty interested in researching the impact could provide a larger-scale transformation. It is important that we have the administration stating this is something it is committed to. The momentum has increased exponentially because of the commitment to the initiative." Like Indiana, San Diego State University wants to provide instructors with a smorgasbord of active learning spaces and technological options, said James Frazee, senior academic technology officer and director of instructional technology services. He described how SDSU created a set of Learning Research Studios to allow faculty to experiment with active learning. "The idea was to build classrooms that we could use as incubators to get faculty to try some new things — and have a safety net underneath them while they experiment with new technologies for teaching," Frazee said. "The underlying goal was to promote curriculum reform and move away from the didactic, one-way flow of information we see so often in large lecture halls, which can be a passive environment for students. The technology is a bait to get them in talking about how they are designing their courses. Recognizing the social nature of learning, we want to encourage more collaboration-minded instructional design such as having their students working on authentic, complex tasks in small groups, using team-based learning strategies to dive more deeply into content than they might otherwise." One of the rooms is called the Learning Glass Studio. It uses a technology for recording lectures that allows instructors to write notes while maintaining face-to-face contact with students: a transparent whiteboard paired with a lecture capture system. The instructor writes normally, left to right; the system records him or her through the glass; and then the recorded image is flipped so students can view the notes correctly through a monitor. The environment allows professors to interact with students and record the session, as well as live-stream it to remote learners. Frazee said faculty members can teach in one of these spaces and then return to their individual college and say, "We need a space like this in our college. Let's do some fundraising and get a donor to put their name on it, and make it happen." He said this has happened in the schools of accountancy, journalism and the learning design and technology program. "They have taken pieces they have experienced in our Learning Research Studios and put them together in their rooms and labs. We are seeing these ideas spreading to the edges of the campus." In fact, the Learning Glass Studio has already spawned an offshoot in two large lecture halls at SDSU. The instructors are using the Learning Glass, and their work is mirrored on enormous screens behind them. They are still keeping an eye on their students, and as they would in the smaller Learning Glass Studio, they are getting their students to come up and work through problems at the Learning Glass. It is all recorded, even in large lecture halls with 500 people. "That is something that came out of people wanting this technology — not just in that smaller, more intimate setting but in our larger spaces on campus," Frazee said. "I don't know of any other university using a Learning Glass in that way." New curricular requirements can lead to the redesign of either classroom spaces or student study spaces. 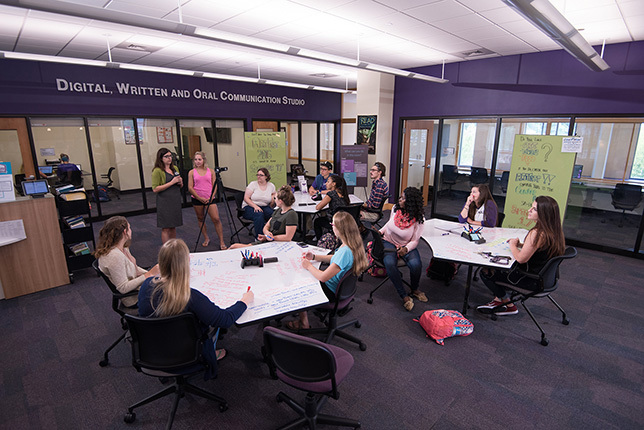 When the University of Mount Union, a liberal arts college in Alliance, OH, added a Writing and Oral Communication (WOC) portfolio requirement to its general education program, that eventually led to the creation of a new space within the library. Launched in 2015, the Digital, Written and Oral Communication (DWOC) Studio is part of a larger project to transform the library into a more modern learning commons. "We used to be a traditional writing center on the second floor of the library," said Danielle Cordaro, founding director of the DWOC. "But once we added oral communication to writing to be taught through the general education curriculum, the writing center didn't fit the new need. We saw a drop-off in the number of folks coming to see us. We had to rethink what we were doing and change with the times." Cordaro worked with consultants and began researching the multi-literacy center movement, which she said is picking up steam in writing centers. She traveled to Eastern Kentucky University to see its Noel Studio for Academic Creativity, which integrates support services for writing, communication and research. She said the concept is starting to take off, but there are not yet many such spaces on U.S. campuses. "You may have a digital media center, a writing center and an oral communication center, but they are all administered separately. It is a new thing to have them under one roof, and it is somewhat controversial still — but the field seems to be moving in that direction." In designing the DWOC, Mount Union decided to create three zones. One is called the invention center, an open social learning space with three whiteboard tables. Cordaro said that students love working on the whiteboards. "Our usage has skyrocketed 72 percent from the previous year, and one factor is those whiteboard tables." Other zones include a quieter writing and speaking room where students can practice delivering presentations, and a multimedia production lab. Cordaro said the new space was designed with the understanding that students will be asked to do more oral and multimedia presentations in their classes in the future. "We made the change because nobody was picking up the peer education part of that," she said. "We have tutoring for almost every subject, especially ones we know students struggle with, such as math, chemistry or writing. We made a move with the curriculum and as the director I saw this as an unfilled need. We have to be a center that pushes the curriculum as well as serves the curriculum." Mount Union doesn't have a teaching and learning center on campus, she noted. "I don't see us as just a center for students. I do a lot of work with faculty, and I plan to do a lot more. They have to make both the writing and oral communication tasks part of the curriculum. Otherwise we will never see students in here working on anything. That is a curricular issue and a faculty development issue. We are working on it."